Below is the final itinerary for the Manaslu Trek, commencing October 10 in Kathmandu. We will be posting on Twitter and Facebook and you can follow our Spot Transponder here. Day 01: Drive from Kathmandu to Barpak (2000m), depending on raod condition may have to walk up the final 1000 m elevation from the valley. 8-9 hours Today, we drive from Kathmandu to Barpak following the road towards Pokhara before turning off . We travel 50 km up the Prithvi Highway then turn north passing through Chanaute where we turn off the road towards Barpak. We climb steadily passing though Baluwa and Rangrung. We pass within 500 metres of the epicentre of the devastating 2015 7.8 earthquake. From Rangrung at an elevation of 850m we climb through Mandre on narrow roads that follow the contour up to Barpak where we spend the night. Day 02: Trek Barpak to Larpak (2200) 6-7 hours We climb from Barpak up 800 metres and over the ridge to Larpak through lush forests and spend the night in Larpak. Day 03: Trek Larpak to Khorlabeshi (875m) 7-8 hours From Larpak the trek follows the contour of the ridge with spectacular views across a 700 metre valley above Gumda and onwards around the contour towards Khorla and then down to the Budh Kandaki river and the village of Khorlabesi where we spend the night. Day 04: Trek from Khorlabeshi to Jagat (1410m) 6 hours From Khorlabesi we take careful note of the weather conditions as this is one of the more hazardous portions of the trek. The left side of the river is dominated by unstable geology and was the site of a recent avalanche which killed 4 and injured 11. We pass upstream past Tatopani and Yaruphant before arriving in Jagarat where we spend the night. Day 05: Trek from Jagat to Deng (1840m) 6-7 hours Today, our trail climbs over the ridge and reaches Dovan. We cross a long suspension bridge over the Yaru Khola and climb some stone stairs to Tharo Bhanjyang. After crossing the river and climbing through small villages, we get to Deng Khola and then to tiny village of Deng where we spend the night. Day 06: Trek from Deng to Namrung (2630m) 6-7 hours Today, our trail climbs up to Rana which is a short distance beyond Deng. After passing some houses, our trail climbs high above the river and drops into the Shringi Valley passing through Bihi Bazar. Our trail makes further ups and down through the forest before reaching Ghap and eventually though thick bamboo and rhododendron forest we reach, after a steep climb, Namrung where we stay overnight. Day 07: Trek from Namrung to Samagaon (3530m) 6-7 hours Today, our trail makes a serious and long ascent through the forest of bamboo and rhododendron crossing the river several times past the villages of Lhi and Lho Bazar. We climb through a forest of oaks, fir and rhododendrons and enter the closely packed houses of Lhi. Further, our trail leaves Lihi village and enters another village of Sho (2960m) where we get some spectacular views of Mount Manaslu North (7157m) and Naike Peak (5515m). Walking further will bring us to the settlement of Shrip. We continue to the village of Samagaon where we stay overnight. Day 08: Samagaon – Pungyen gompa – Samagaon or Manaslu BC Today is spent gaining acclimatization to altitude. 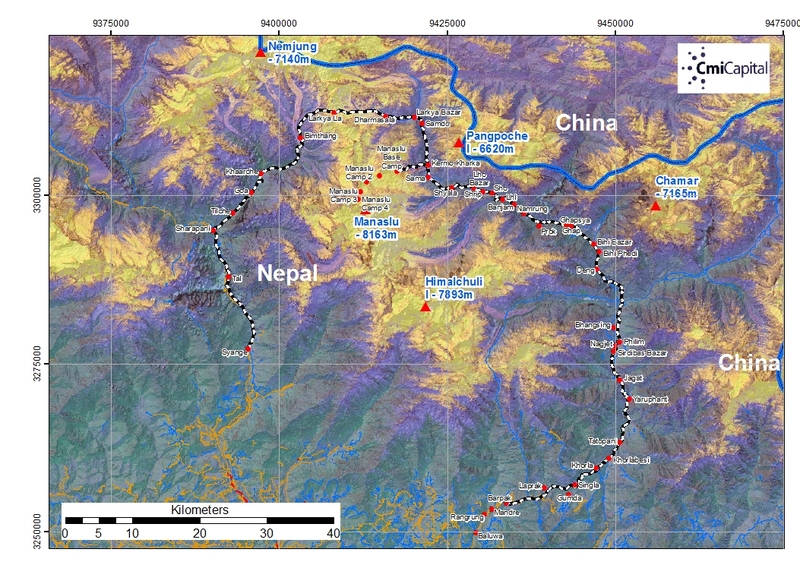 We will, depending on the weather and avalanche risk either climb to Pungyen Gompa or Manaslu Base Camp up the glacier. Day 09: Trek from Samagaon to Samdo (3830m) 4-5 hours Our route from Samagaon passes juniper and birch forests and the stone huts of Kermo Kharka today. Trekking further for some hours, we eventfully reach at Samdo where we stay overnight. Day 10: Samdo: Acclimatization and Exploration Day We spend a day in Samdo for acclimatization above 4000 metres. We will hike up into the surrounding hills and we stay overnight at Samdo. Day 11: Trek from Samdo to Dharmasala (4470m) 4-5 hours Today, we descend on a wide and gentle trail from Samdo. We pass through a stone archway. We climb gently over the huge Larkya Glacier and get to the ridge where there is a viewpoint over the edge of a huge gorge. We reach Dharmasala after trekking for some hours. We stay overnight at a local guesthouse in Dharmasala. Day 12: Trek from Dharmasala to Bhimtang (3720m) 8-9 hours Today, we leave Dharmasala very early crossing several moraines. We ascend past four frozen lakes and reach Larkya La from where we can witness the tremendous views of Himlung Himal (7126m) and others including Annapurna II, Gyaji Kung, Cheo Himal, and Kang Guru. We further descend along the grassy moraine to a small meadow called Bhimtang where we stay overnight. Day 13: Trek from Bhimtang to Tiliche (2320m) 5-6 hours Our trail today drops from Bhimtang and crosses a glacial stream. We then descend into a beautiful forest of pine and rhododendron to Hompuk. After descending further, we reach the fenced field of Karache and to the village of Gho. Tilche is nearby, where we spend overnight. Day 14: Trek from Tiliche to Tal (2300(m) 5-6 hours Today, our trail drops down and passes through several fields, houses, and forests of rhododendron and oak. We descend through a scrub forest and reach Dharapani. Trekking for some time, we eventually reach at Chyamje, where we stay overnight. Day 15/ 26th Oct: Tal – Syange (1080m) 6-7 hours Today we trek down the Marvangdi Valley to Syange where we spend the night. Day 16: Drive from Syange to Kathmandu 8-9 hours Today, in the morning, we drive back to Kathmandu from Sange It takes approx. 8-9 hours to arrive at Kathmandu. We celebrate the farewell dinner together with Green Valley Nepal Trekking Team. We stay overnight at standard hotel on B/B plan.